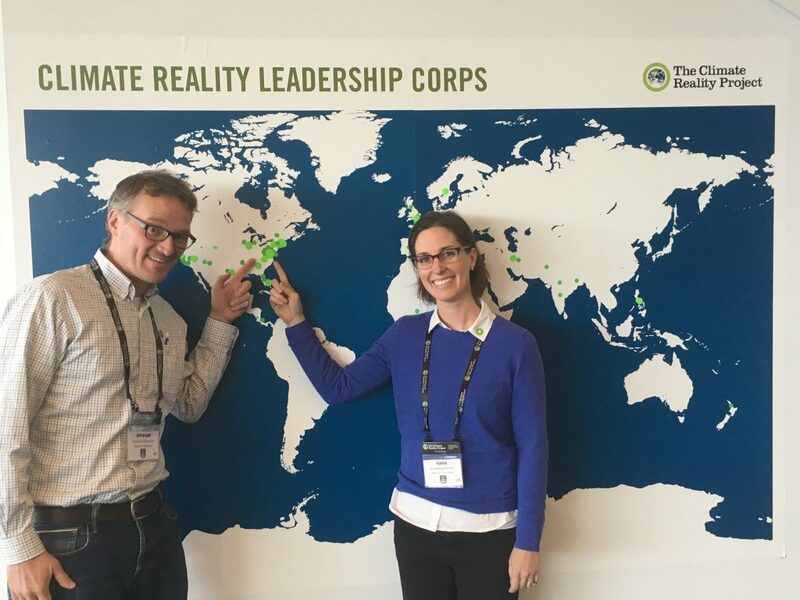 Pashek+MTR Principal Kara Roggenkamp attended the Climate Reality Leadership Corps Training in Pittsburgh this October. Nearly 1,400 people (including 500 from southwestern Pennsylvania) participated in this three day workshop led by former Vice President Al Gore, with sessions led by world class scientists, business leaders, policymakers and innovators. Pashek+MTR Principal Sara Thompson sat down with Kara to talk about her experience at the training. Pittsburgh Climate Reality Training group photo. Image credit: Climate Reality Project. 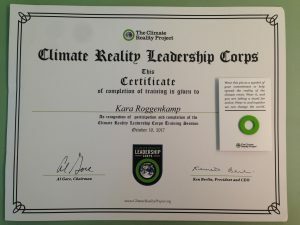 Sara: What was the most important thing you learned at the Climate Reality Training? Kara: After three days of intensive sessions full of facts and data, it’s hard to boil it down to one thing! It was incredibly inspiring to learn from accomplished climate experts and innovators and to connect with other people who share this interest. But probably the most important thing that I learned was that the urgent threat of climate change demands that we make a dedicated effort to talk about it with everyone, especially with people who might be skeptical, however intimidating that might be. It’s time to shift the conversation to focus on solutions and positive change. Sara: That makes sense. How has your attitude toward climate change altered? Kara: As a landscape architect and a mom, I was already concerned about climate change, but going to the conference was a unique opportunity to be immersed in every aspect of it. One of the things I’ve been wondering about is at this point, what can we realistically expect the world to be like, best and worst case scenarios, in my lifetime and my kids’ lifetimes? What would “1.5 degrees C temperature increase” (the best case) actually mean for my kids when they are my age? It was amazing to get an answer to that question from Dr. Michael Mann and Dr. Henry Pollack, two world-class climate scientists. I learned that at this point some fairly scary (and expensive) impacts are unavoidable. But, we still have the opportunity to craft a better future for our children—we can reduce emissions, and we can adapt to the changes that are coming—but we have to act now. The good news is, for much of human history, we have been looking for an inexhaustible energy source – and now that technology actually exists and is being rapidly adopted throughout the world. The clean energy transition is a turning point similar to the industrial revolution or the development of the internet, and I find that inspiring and energizing even in the face of this challenge. Sara: I’m sure you had some expectations going into the training. But, what surprised you the most? Kara: Going into it, I didn’t realize that it was actually an international conference. Although there was strong representation from Pennsylvania, there were also people from Africa, the U.K., India, and all over the U.S. There were a lot of familiar faces from Pittsburgh also. I was glad to see an effort to cast a wide net. One of the opening sessions was a focus group discussion with Veronica Coptis from the Center for Coalfield Justice, Fred Brown from the Homewood Children’s Village, and Khari Mosley from the BlueGreen Alliance. They spoke powerfully about listening and finding common ground with people who might not have been part of the environmental movement in the past. Sara: I heard that parts of the training focused on local issues. What are local people saying? Kara: There is so much happening here in western PA, both in the public and private sector. We have 14,000 people in the Pittsburgh area currently employed in the renewable energy and energy efficiency industries. At the conference, I attended an eye-opening presentation by Sharon Pillar (from Solarize Allegheny) and Zaheen Hussein (Sustainability Coordinator for Millvale). Millvale has lowered utility bills and saved money by installing solar panels and retrofitting buildings for energy efficiency. I learned about the potential solar array that could be developed at the former Shenango Coke Plant site, right across the river from where I live. Pittsburgh has more building square footage committed to the 2030 Districts Network (www.2030districts.org) than any other city. And of course Mayor Peduto spoke about the City’s commitment to transition to 100% renewable energy by 2035. There is still a lot to be done, but these are all really positive developments in our area. Making the switch to clean energy has so many co-benefits as well – in terms of creating jobs, spurring economic growth, and reducing harmful air pollution that is a byproduct of burning fossil fuels. Sara: It sounds like you learned a lot of valuable information about climate change. What do you plan to do because of the training? Kara: In addition to spreading the word about climate change and solutions in general, I’ve been thinking more about how address climate change through landscape architecture. We plant a lot of trees, which is good (as Dr. Mann said, trees are the best carbon capture-and-storage technology), and we’re big on bicycle and pedestrian infrastructure. I’d like to look into reducing carbon intensive materials such as concrete and fossil fuel use on construction sites. Adaptation to climate change (such as more intense storms) is a design challenge that is ongoing. We’re planning on having an internal brainstorming session on this topic at Pashek + MTR later this month. In addition, three of us are pursuing Sustainable SITES accreditation so that we can bring that particular skill set and expertise to the projects we work on. It’s official! Got my certificate and green circle pin. Sara: So, you know what you can do as a Landscape Architect, do you have advice on what the average person can do? Kara: There is so much that people can do to reduce their own carbon footprint, such as driving and flying less, getting an electric car, eating less meat, reducing food waste, installing LED lights, and those kinds of things. You’ve spearheaded a bunch of these strategies at Pashek + MTR’s office as part of the Green Workplace Challenge – for example, you switched our office electricity supplier to a company offering 100% renewable energy. Sara: Taking steps to reduce your carbon footprint can seem like a daunting task. Where can someone start? Are there any good resources out there? Kara: I recommend the “Don’t Just Sit There – Do Something” series of funny, short web videos on climate change by Pittsburgh’s Dr. Joylette Portlock, available at www.communitopia.com or on YouTube. There are also some great TED talks on climate change policy, such as Ted Halstead’s presentation on carbon pricing (available on YouTube or www.ted.com). The Climate Reality Project website, www.climaterealityproject.org also has a lot of great info. I should also mention that as part of the Climate Reality Training I have a presentation on climate change science and solutions that I can give to any groups that might be interested. There are so many ways to address the issue of climate change, but we do need to develop the political will to tackle them at a large scale, and quickly. The training was held at the David L. Lawrence Convention Center. 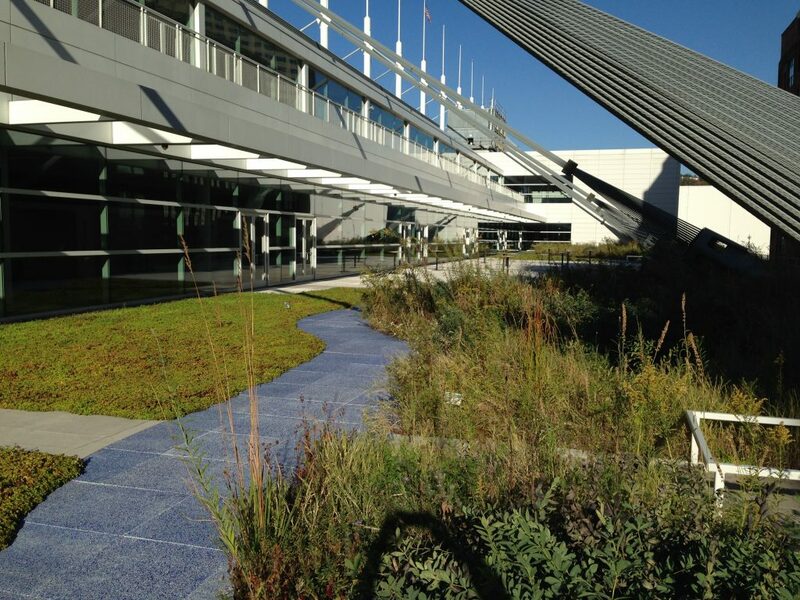 Pashek+MTR designed the green roof, which helps absorb rainwater and insulate the building.